Four women who are lieutenants in the Afghanistan military have come to the United States to study English at the Defense Language Institute at Lackland Air Force Base in Texas. But it's their dreams of piloting helicopters that could help change the future of women in their homeland. These four Afghan women will spend anywhere from six to eight months in San Antonio at the base where they will be mastering the English language. After that, they'll move to Alabama where they'll train with the U.S. Army and learn how to be helicopter pilots. Editor's Note: David Cortright is the Director of Policy Studies at the Kroc Institute for International Peace Studies at the University of Notre Dame. He is the author or editor of seventeen books, including most recently "Ending Obama's War: Responsible Military Withdrawal from Afghanistan" (Paradigm Press, 2011). He testifies this week at a hearing on women in Afghanistan before the Tom Lantos Human Rights Commission of the Committee on Foreign Affairs in the U.S. House of Representatives. What will happen to Afghan women when the United States begins withdrawing troops later this year? Will women be thrown under the bus as soldiers head for the exits? To find out what Afghan women think, my colleague Sarah Smiles Persinger and I authored the report Afghan Women Speak, based on more than 50 interviews in Kabul with policymakers, diplomats, military officers, and most importantly Afghan women, including female parliamentarians, activists, health and NGO workers. 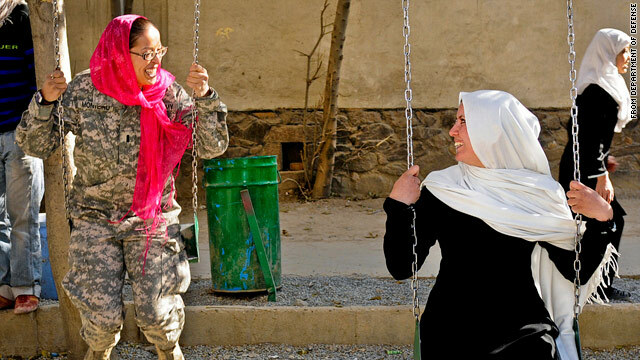 A mother and daughter from Afghanistan trying to bring change through business. CNN's Mary Snow reports. "I had so many dreams for my life, but when I saw him, they just disappeared." Saraya spoke softly, her hunched-over body and nervously twisting hands testimony to all she says she has had to endure. Emotions and turmoil she never dared publicly speak of tumble out freely - concealed, along with her face, behind a mask. Police in southern Afghanistan have arrested the father-in-law of a woman whose nose and ears were chopped off after she was accused of bringing shame to her family.